The period since the last newsletter has seen a lot of activity. 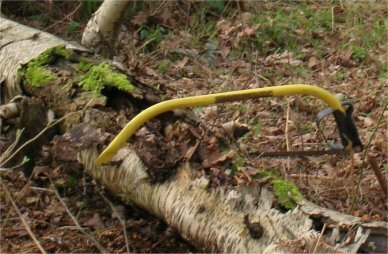 On the 10th of May 2011 a hardy band comprising Claire Abbott, Rosemary Etheridge, Alastair Johnstone, Dave Bailey, Peter Williams, Robert Stone and myself penetrated the holly thickets of Pear Wood and dismantled a number of pirate radio transmitters. The material removed included scaffolding pole structures reaching up into the treetops, camouflage netting and electrical equipment (see our web site for some pictures). Apparently a studio in Harrow or Wembley would beam its signal to a dish in Pear Wood, and the program would then be rebroadcast from the high aerials on this ridge that commands all of London. As far as we are concerned it’s not the illegal broadcasting we object to but the rubbish they left and the fires they set, some of which consumed entire fallen trees. Our hope is that removing the scaffolding poles has caused them significant inconvenience and that therefore they will go elsewhere next time. Our thanks go to Michael Wynne and Dave Corby of Harrow Council for organizing a grab loader to take all the rubbish away early the next day. We did not want to leave it for even half a day since the radio pirates would likely have repossessed it. On the 7th of June 2011 members of the Bentley Priory Management Committee walked around that site and saw the work that Peter Peretti has organized at the west side of the lake near the Master oak during the winters of 2009-2010 and 2010-2011. At this point Spring Meadow and the lake are less than 100 metres apart but until recently the trees were so thick that a walker on the main path around the lake was unaware of the meadow and hard pressed to see the lake. Now the Master stands proudly at the lower end of Spring Meadow and there is a clear view to the lakeside and the rhododendrons on the other shore. All this is lovely for the visitor but should also benefit wildlife by letting sunlight in to the bankside water. One of the lake islands has been cleared of scrub and the channel around it deepened so that nesting water birds are less likely to be disturbed, at least by humans. Further work must wait: the Environment Agency reported seeing water voles at Summerhouse Lake, so the Herts and Middlesex Wildlife Trust will survey the site and tell us if they are truly present and if so how we should manage the site to improve it for these iconic rodents (which are a UK Biodiversity Action Plan priority). We welcome Elliot Bertram to our team. He will act as a publicity officer, and his first act has been to set up a Twitter account. For those who have heard of Twitter but have no idea what this is, it allows us to post short (140 characters or less) up to the minute messages – it would be especially good for sightings of birds or insects but the essence of the site is its immediacy and triviality, so even messages as simple as “Up on Stanmore Common – sun shining – blackcap singing - lovely” would be good. The hope is that people will sign up to follow us – that is, get these messages as soon as we post them, and that this will draw them in to actually volunteering on our sites. If you have a message that we could post, please email it to Elliot at <harrowncf@gmail.com>. As noted, the message must be 140 characters or less – if it is longer, Elliot will edit it down. To receive the messages, you need to sign up - click on this link to sign up to our Twitter feed. A more old fashioned exchange of information will take place at 8:00 PM on Monday October 10th 2011 in the Blackwell Hall, Harrow Weald, where a joint meeting of the Forum and the Harrow Natural History Society will focus on Stanmore Common. We hope this will be the first of an annual series where we can mine the Natural History Society for information about the flora and fauna of a particular site, and in return they can guide our future management activities. This counts as a regular meeting of the Harrow Natural History Society: if you are not a member please do come along but bring a £2 visitor fee. None of our activities are possible without the funding we receive from our parent body, the Harrow Heritage Trust. Leaving aside paying for tools, leaflets, the web site and BTCV working parties, this money pays for insurance without which we would not be able to work on our sites, since without it we would be personally liable should anyone believe they have been injured as a consequence of our activities – this is not a theoretical risk, it has happened. This year neither the Trust nor Bentley Priory Nature Reserve received any money from the Council. The Harrow Heritage Trust has very kindly decided to fund our activities this year out of their reserves, so we can continue to maintain Harrow’s open spaces and provide information about them to the public, but this is clearly not a viable option for future years. Gill Lewis reported that spring flowers had been looking lovely in the churchyard. An early Primrose had been seen in December. An entrance sign and gate have been requested for the entrance to the Nature reserve and Section 106 money could be used for this. Betty Brown reported that the Bentley Old Vicarage AGM had had identified three themes for the coming year. Rev James Mercer was working on the use of the reserve for education. The restoration of the pond and the replacement of the tree labels were the other two projects. Section 106 money could be used for the pond liner, the tree labels and the outstanding path resurfacing. The issue of Management plans was raised and Dave Corby reported that Denis Vickers was working his way through a long list. Peter Peretti was thanked for the two English Walnuts that had been planted in memory of two former volunteers. Peter Peretti reported that the clearing of the woodland has continued. The edge and the west shore of Summer House Lake were now much more open. The water table has remained constant and the lake looks better. One of the islands having been cleared of overhanging vegetation, light is now getting in and the birds are coming back. It is hoped to clear a further length of the shore up to the little bay so that the whole of the west bank will look more open and the fields will be linked to the water. A notice under the Oak trees would be useful to explain the work that was being carried out. The issue of the surveying of the RAF sewer by the owners of Bentley Priory was mentioned and it is an issue which needs to be monitored. It was important that dogs were kept on leads in Spring Meadow for 3 months during the nesting season but the issue of signage was deferred until the Friends of Bentley Priory meeting on the 7th June. Laurel had been cleared from the Priory Drive entrance and Hazel would be planted. Section 106 money would be used for this, the general scrub and Bramble clearance and the initial work on a Water Vole survey. Three walks for birdsong have taken place. 8 Chiffchaffs, more than 18 Blackcaps and up to 10 Whitethroats were noted also Wrens had occurred in large numbers after the cold winter. The issue of maintaining the right of access through Lower Priory Farm was discussed. Steve will meet with Peter about this and then a letter will be sent from the council. The swallows are doing well as usual in the stables. On 19th April 2011 Dave Corby, Sally Reeves, Denis Vickers and Steve Bolsover visited Newton Farm and agreed on modifications to entrances to reduce trash dumping. Claire McDermott was unable to be at the meeting but had sent a report. The Healing Garden is looking wild and wonderful. Claire has reported good combinations of meadow plants and grasses, but would really like to invite the Harrow Natural History Society (HNHS) to do a survey of our plants. So far a group of five Ladies had been gardening in the healing garden this year and they would really appreciate the HNHS’s knowledge in identification the plants on the reserve. Thanks to Dave Corby for removing the rubbish. There is an interior of a car over there now, which needs removing. Two BTCV days are requested. The next date for volunteering is 29th May. Claire Abbott reported that a very successful clear up day had taken place with the disposal of the scaffold, netting and electrical stuff from the mysterious goings on over the last 3 years. The catalyst for action was that a man had been found living in a Ray Mears style hide out. The equipment removed was probably being used for radio transmitting. A new local Scout group (Pinner and Headstone Explorer Scouts) had been welcomed and Claire and Rosemary showed them round the site, gave them guidelines etc and their stay went very well. The visit in March from the Herts and Middlesex Wildlife Trust to maintain the dyke went well and good progress was made. 9 people attended and the rubbish was burnt. Another nest of ants from the Royal National Orthopedic Hospital was translocated on the 6th April and it seems to have been very successful. An attempt was made to introduce bee hives onto the site, but after 2 months, the beekeeper had removed them as they were not doing well. The problem appeared to be that there was too much shade and the bees could not find their way out of the wood. Another site has been partially cleared in a new area and the beekeeper will be consulted to see if it is suitable. If it is, BTCV will clear the area. Claire reported that at last there was a new lock on the gate. The repairs to the fence along Wood Lane are still outstanding. It was also requested that the water to the Scout field be reconnected. Both these matters could be financed by the section 106 money. Dave Corby is to take action with regard to the Japanese Knotweed problem just outside the boundary of the site. Species and sightings. Firstly the strange tree on the dyke has been identified and will be moved into a garden setting. It had been a fantastic year for Grass Snakes and 9 were seen in 15 minutes last week under the roofing felt around the scrape; also three Hornets living singly in a nest. The Toads have again had a good year. The Mandarins were breeding; a Cuckoo has been heard and a Buzzard seen. It has been a good year for the Bluebells and the Orchids are surviving. Claire was very pleased to report that Great Crested Newts had been found on two sites. This means that a grant of up to £4000, from Froglife will be available for the much needed restoration of Gilbert’s Lake and the Grimsdyke Hotel is also contributing. David Corby indicated that his team will also be doing some of the routine work. Dave Bolton reported that the pond was holding water well, two and a half feet down. Frogs were using the pond and tadpoles were present. Plants have not become established in the pond as yet and the banks were still muddy. Four working parties have taken place: wood had been removed from the pond; 2 fallen trees had been disposed of and litter picking has continued. An encroachment onto the site had been reported and was being dealt with and the resident in question has ceased to cultivate on the site and was being asked to reinstate their original boundary. The Yew trees which had been grown will be planted out throughout the site. Dave reported that he had moved a glazed door to a position at the edge of the site and requested that it be removed. A drain had been opened up leaving a dangerous drop and this needed to be dealt with. The Blackberries were in flower already and 2 grass cuts of the path boundaries had been carried out already. Simon Braidman reported that scrub clearance work had continued via working parties and a lot of the site was looking good. The Heathland regeneration was going well. Unfortunately there was now no sound volunteer base. Compartment 20 (Bluebell Heath) had become very overgrown. It was agreed that Steve would look into applying for a grant to use contractors to clear this area so that in the future it could be mown by the council. Simon requested that section 106 money be used to use a contractor to spray the Bracken in August or September. The dry weather was taking its toll and there appeared to be no orchids. Angelica and Betony were out; Willow Warblers were on the site and the Lesser Spotted Woodpecker has been heard. John Hollingdale reported that there had been one BTCV visit to the site in February. John has continued to carry out routine management on a regular basis; clearing brash and removing and treating stumps. John reported that of the three new gates in Lower 40 Acre field one was fine, another had dropped and the third cannot be opened. Dave Corby will look into this. A 3 metre swathe is being cut across the site in order that the gas main can be maintained. A successful moth night was held with 28 Macro moths being identified. The Spring walk was also quite well attended and the usual harbingers of Spring were observed. It was also confirmed that over the summer the cattle trough and water supply would be put into working order. Also the Brockley Hill Kissing gate. Section 106 money would be used for these. Robert Stone’s written report stated that he draining of Caesar's Pond has certainly cleaned up what water there is, but it must have blocked one of the springs, because the water never returned to its level before the work was done. Even before the dry spell, the pond only reached about half a meter below its previous level. The level of Spring Pond is also very low, but that may be the dry weather. Dave Corby reported that it had been looked at and it may be that the run off form the Rugby pitch has been stopped. A family of Mandarins was living at Brewery Pond.